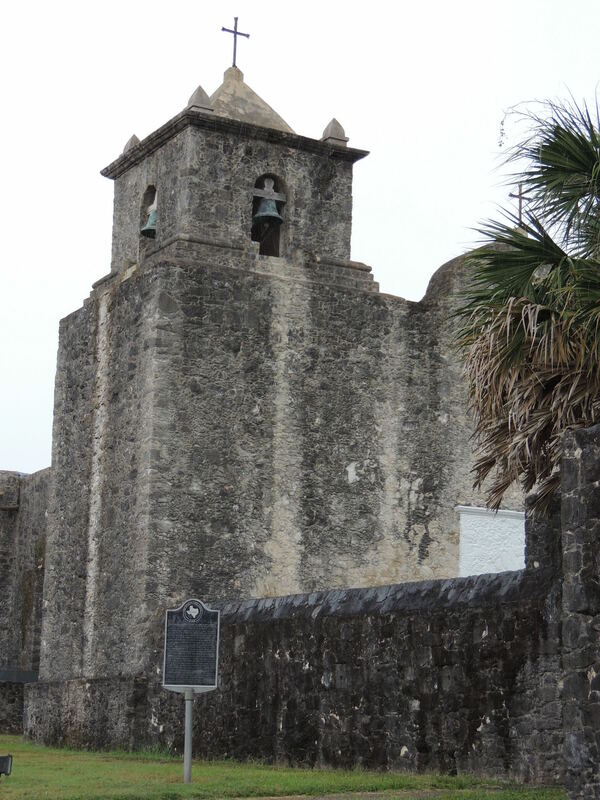 Of course, everyone knows “Remember the Alamo!” But, what’s this “Remember Goliad”? Presidio La Bahia played a major role in the early days of the Texas Revolution. In 1836 Colonel James Walker Fannin took command of Presidio La Bahia. At the Battle of Coleto Creek, the Mexican army defeated Fannin and his army of 400 men. The men were held captive for a week at La Bahia. On the order of General Santa Anna, they were taken to Goliad and shot; Fannin was shot last. 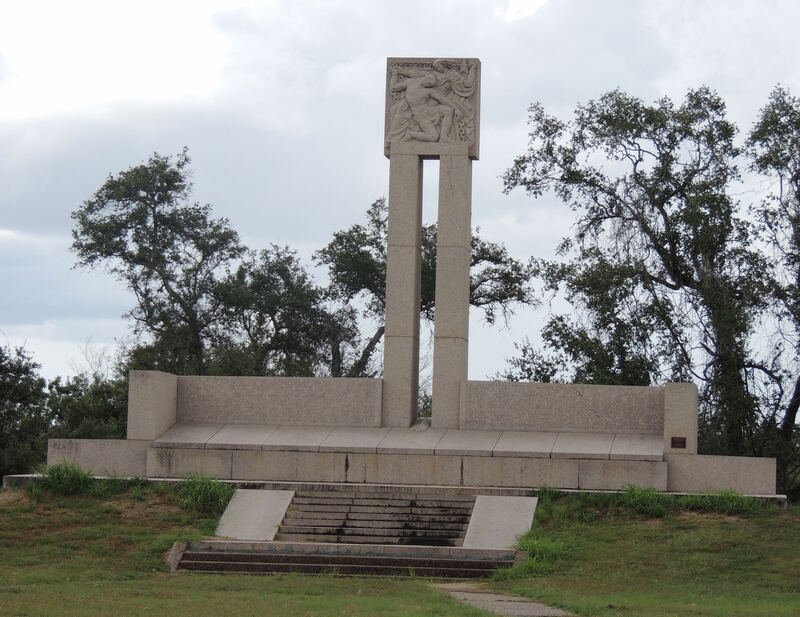 The Goliad Massacre inflamed the Texas cause and at the Battle of San Jacinto, the battle cry was, Remember the Alamo! Remember Goliad! This short video shows the perimeter of La Bahia. If you’ve ever wondered why we celebrate Cinco de Mayo, it’s because of the military skills of General Ignacio Zaragoza. He was born in 1829 near Presidio La Bahia. His great military accomplishment was the defeat of the French at the Battle of Puebla in 1862. The French armies were considered the best military forces of the time. Yet, General Zaragoza was able to win victory. 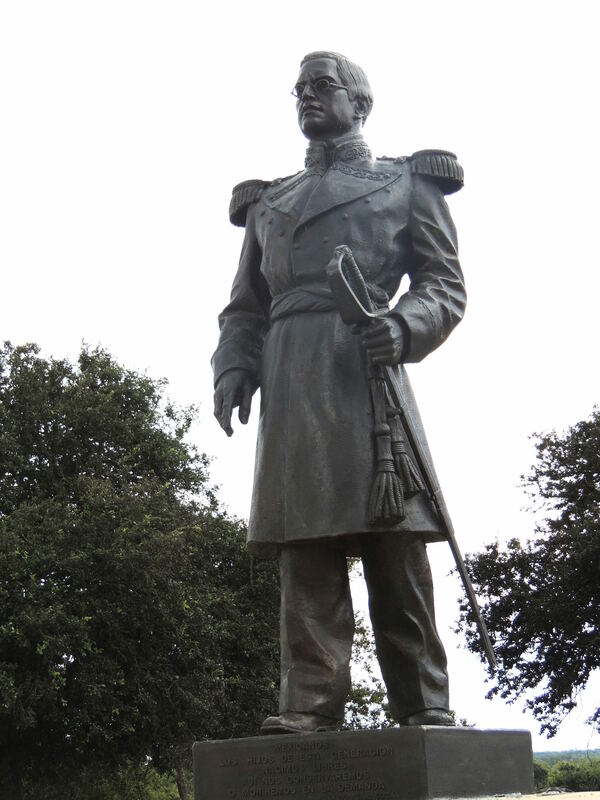 His statue, donated by the people of Puebla, stands at the entrance to Presidio La Bahia. Burial site of Colonel Fannin and his men. 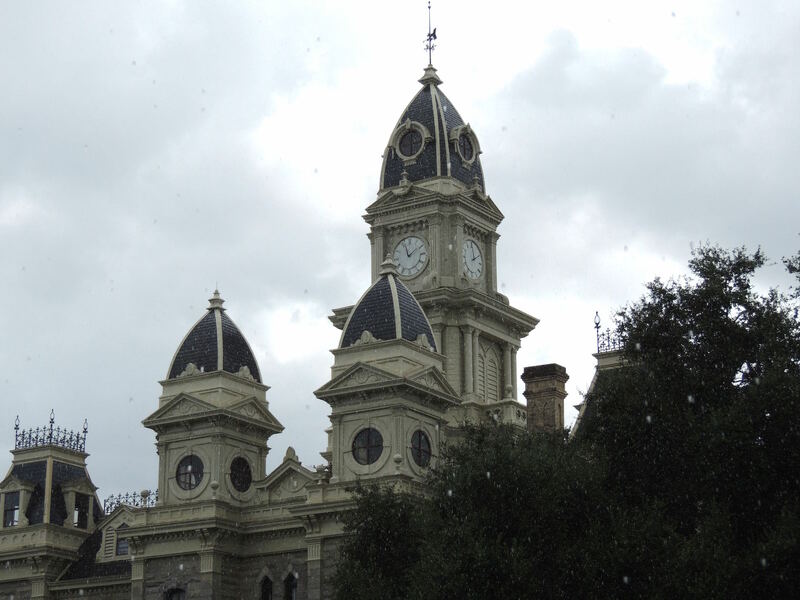 Founded in 1749, Goliad has approximately 2,000 residents and is one of the oldest municipalities in Texas. 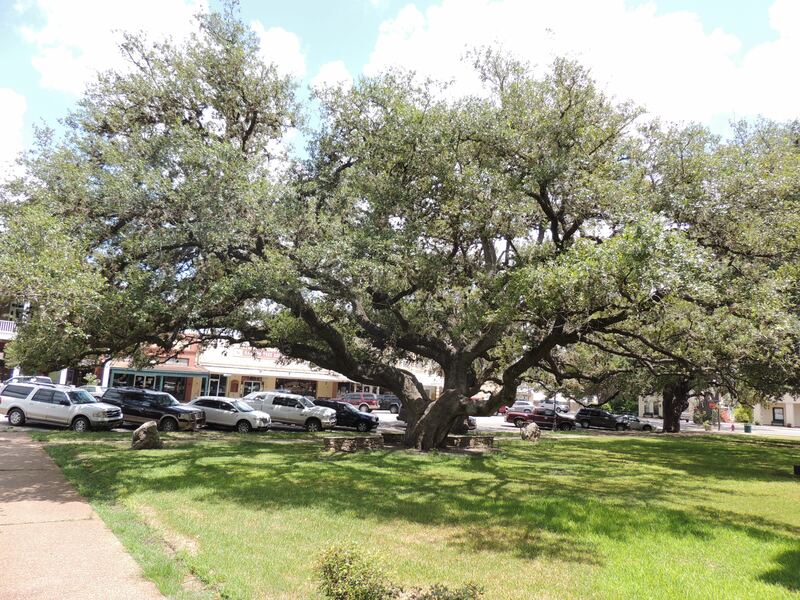 The courthouse has that 1800’s charm, especially with the Hanging Tree (Cart War Oak) that stands on the north lawn. The Hanging Tree was the scene of both court-approved and unauthorized executions. 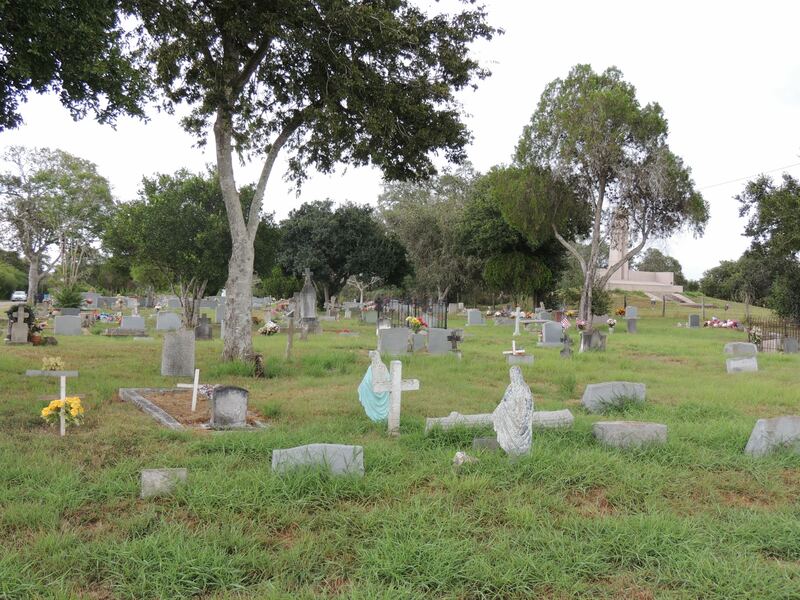 The area thrives on ranching, agriculture and tourism to this historic Texas site. 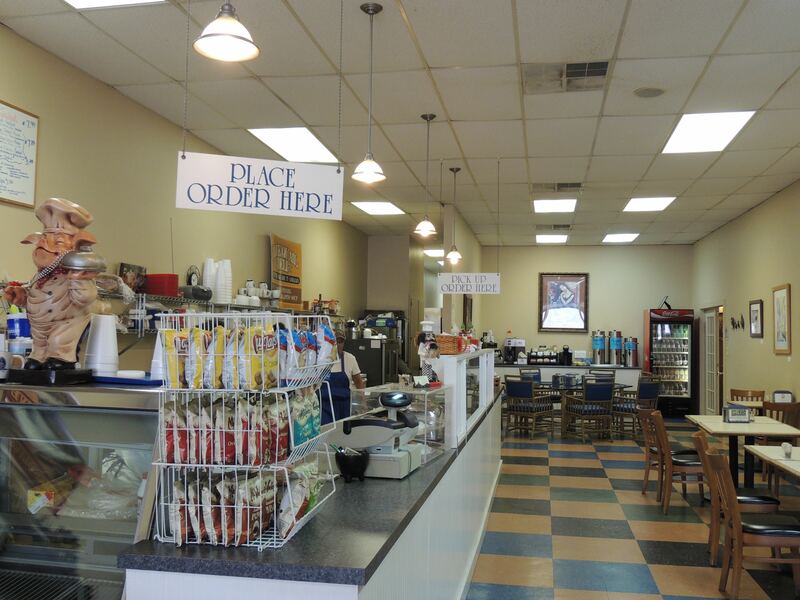 After exploring the beautiful Goliad courthouse, we enjoyed lunch at the Blue Quail Deli. The special was a muffuletta sandwich on homemade bread. I indulged in the Deli’s famous Cream of Jalapeno Soup, then topped it off with Apple Cobbler. I was maximum full! Jimmie Dale Rader (left) and Georgia Lee Swickheimer (right). The best part of Goliad are the people! 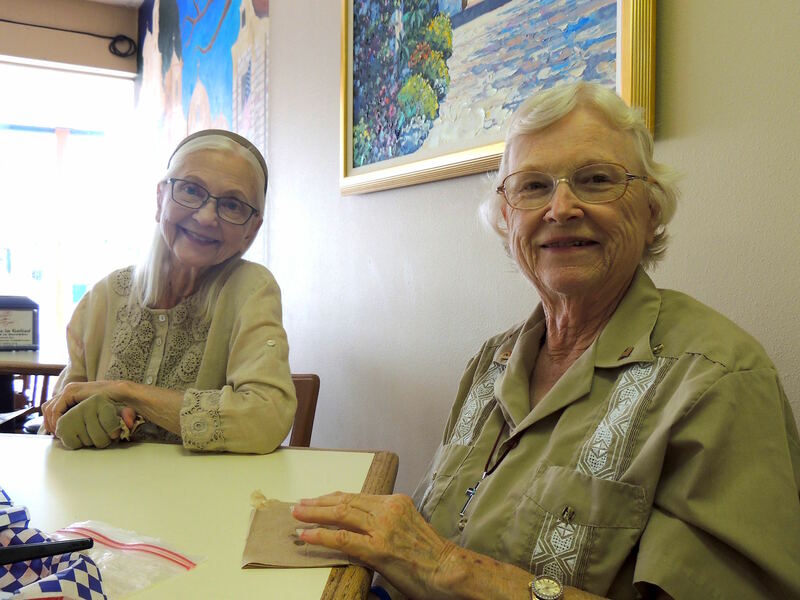 Two local Goliad residents, Georgia Lee Swickheimer and Jimmie Dale Rader, were enjoying lunch at the adjacent table. I asked them, “What is your favorite thing about Goliad?” Georgia Lee thought for a moment and said, “The people. We’re all like one big family here.” That’s nice to know that an entire community is there for support and friendship. 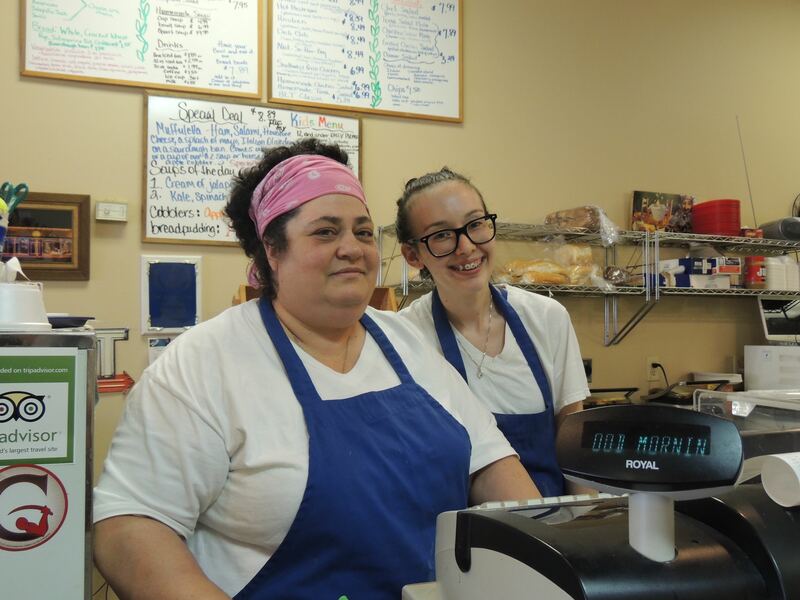 Patti McCraney and her assistant were helpful in guiding visitors in making the best selections on the menu. I only regret that I didn’t buy a loaf of the homemade bread to take home. But, I can always make another trip to Goliad, but next time, I want to try the peach cobbler! A special note: Goliad Market Days are the second Saturday of the month all year. It is a large gathering of visitors and vendors. 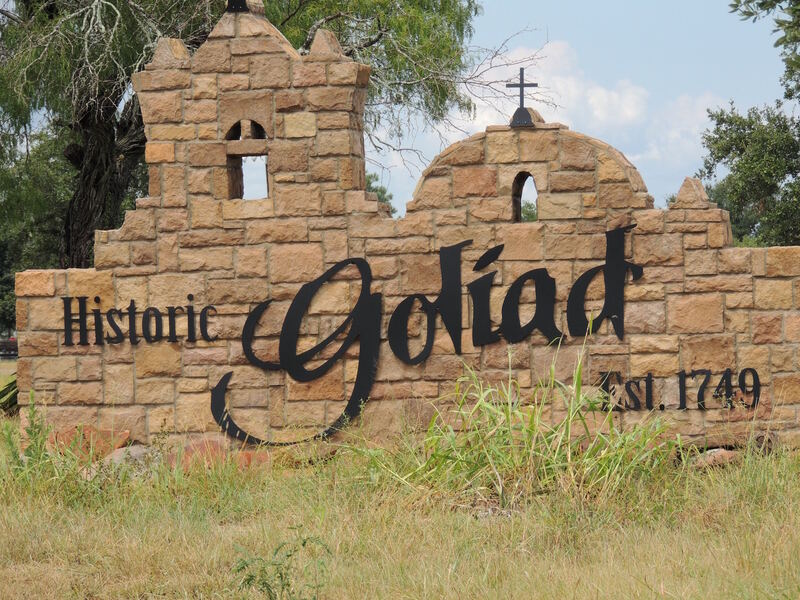 If you want to enjoy a fun “end of summer” adventure, head to Goliad for the market on the historic square.